Residence MAR is a 180m2 seaside villa surrounded by 1100 m2 of Mediterranean vegetation garden fenced with old stone walls. The villa was originally built in the 16th century in a combination of gothic and renaissance style. 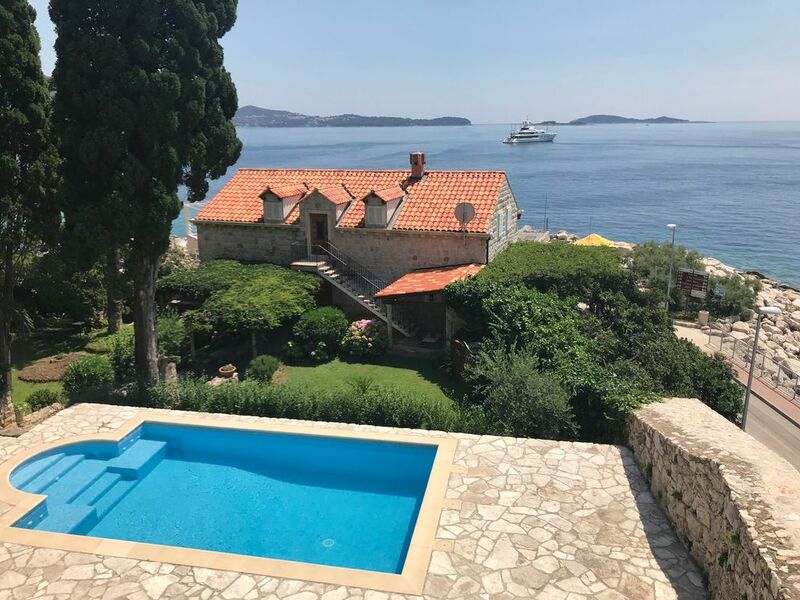 Residence MAR it is located in a small town of Mlini, situated 8 km south of Dubrovnik city and 10 km north of the Dubrovnik Airport. Located in its vicinity are numerous coffee shops, restaurants, diving centre, supermarkets etc. 20 m2 garage and 2 parking spaces in front of garage. The first floor: the main entrance door leads into a hallway followed by a spacious living room. The living room decorated with antique furniture is equipped with Wi-Fi internet and satellite TV. From the living room, you enter into a dining room and kitchen with a dining table seating 8 persons. The kitchen has all the necessary amenities: stove, oven, refrigerator, coffee machine, electric kettle, toaster, wine fridge. Both the dining room and the kitchen have access to the terrace with a breath-taking view of the bay. There is a table for 8 people and lounge area on the terrace. The second floor: the main entrance door leads into a hallway which leads into 4 double bedrooms. Two double bedrooms can accommodate additional baby cot for small children. All rooms have their own bathrooms. Each room has a sea view. The entire villa is air-conditioned, has LCD TV with satellite TV, and wireless Internet. In addition to having a beach directly in front of the residence, and two more beaches surrounding the house, there is a private swimming pool in the garden. The swimming pool is open from 01.05. till 31.10. while the rest of the year is closed. The garden features a variety of Mediterranean vegetation (palm trees, cypress, olives, and seasonal flowers). Barbecue grill and an outdoor shower are also available in the garden. During the summer months, there is an hourly boat connection Dubrovnik-Cavtat-Dubrovnik with a quick stop in Mlini. NOTE: Check-in/Check-out policy is very strict. If you have early arrival or late departure please contact owner. It is hard to know where to start: the town of Mlini is charming, with very nice people and good restaurants. The property is located just across a small beach, walking distance (as most beach front Mlini) to restaurants and other beaches. It has all the comfort and amenities of a modern house, but with character and charm. All four bedrooms have sea view (no fighting among my kids to select the "best bedroom"); the view from the terrace is spectacular (very relaxing when I worked in the early hours of the morning, taking advantage of the time difference with the US); the garden is beautifully well kept; the swimming pool and BBQ grill are strategically located to provide both a nice view of the sea, and safety if you have small kids (you have to get up some stairs, giving you enough time to catch a runaway grandson!). Even though it was in mid-Jul, we didn't run the a/c all the time, as the walls provided isolation from the heat, allowing us to open the doors/windows and enjoy the nice Adriatic breeze. The property is kept impeccable: they do the swimming pool and the garden twice a week, and is delivered to you with all the essentials (including beach towels) for you to enjoy your stay. Lastly, but certainly not least, Katarina was a very grateful host: she help us getting the transportation from the airport, had a delicious apple strudel welcoming us, and was always available to assist us when needed (she cam quickly when one of my sons locked his safe box, contacted a catering for a gathering we had for the final of the FIFA World Cup). I would love to return to this property in the near future! We loved Villa Mar so much that we almost don't want to tell you how lovely it was ... and keep it all to ourselves. Katarina and her Mother did a wonderful job of preparing this beautifully maintained and well-equipped villa for our stay. There were fresh flowers, wine, milk and home-made apple strudel upon our arrival and they ensured that we had everything we needed to make our stay happy and relaxing. The layout of the Villa is great for groups of different couples who may want a little space to themselves and it is great to separate the bedroom space from the downstairs living area with the external stairs so that those who wake early or are late to bed don't disturb others. We miss the stunning views across the bay from the terrace and the pool area and can't wait to go back again to enjoy them. The tortoises are fun too and you'll quickly fall in love with them. The situation of the villa itself is just perfect, being a 15 minute car or water taxi ride into Dubrovnik Old City to enjoy sight seeing or nightlife but there are also plenty of great restaurants locally in which to eat and a very welcoming bar for relaxing drinks nearby. Katarina is a great host and ensured we had everything in place before our arrival, including arranging car transfers from the airport to the villa. Thank you so much for a wonderful stay .... we will be back again and again and again! Beautiful oasis in a perfect location! We stayed 12 days at this beautiful house with probably the most amazing garden in the greater Dubrovnik area. We enjoyed every second of our stay and would definetely come back again. The house was very clean and perfectly equiped (towels, hairdryer, wachingmachine and a perfectly well equiped kitchen). On our arrival we have been received extremely well, and felt home quite fast. We were shown around in the whole house and garden. The view is stunning and we totally fell in love with the 9 turtles who live in one part of the garden. Thanks for making our vacation so beautiful. We stayed at Residence Mar for a week in April 2018. The view from the terrace to the sea was magnificent, and the back yard was nicely secluded behind the stone walls. The children loved the tortoises living in the yard. There were four bedrooms all equipped with a bathroom on the second floor - it was perfect for us since we had several couples with children staying. The villa is right next to the Mlini harbor, from where you can take a short boat-ride to Dubrovnik, Cavtat, Lokrum, etc. We received amazing hospitality from Katarina, who took care of everything at the villa. Fabulous outside space in a great location. Lovely property particularly the gardens and outside areas. Great location for getting about by car or ferry to Dubrovnik/ Cavtat and plenty of good restaurants a few minutes walk away. Highly recommended. Bookings can be arranged only from Saturday till Saturday in some cases Sunday till Sunday. We do not accept bookings in the middle of the week ONLY IF booking start or end on Saturday. Arrival time should not be earlier that 4 p.m. on the arrival date. The departure time should not be later the 10 a.m. on departure date.